Chicken thighs are the best part of the chicken and the perfect weeknight protein. If you don't believe it, just consider this: Chicken thighs are juicier, cheaper and easier to cook than chicken breasts. Plus, this meaty cut of chicken is so versatile, it works in plenty of different dishes. From tacos to Chinese take-out inspired recipes, we've got the best ideas here for delicious dinners you can make using humble, but mighty, chicken thighs. Love fried chicken, but don't love all the calories and fat in the traditional recipe for this comforting meal? 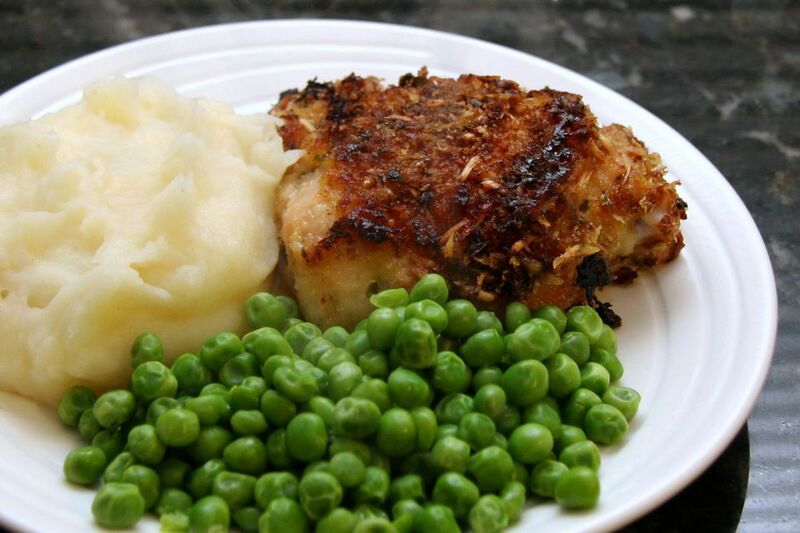 You're sure to enjoy this healthier "fried" chicken recipe, in which the chicken is baked (not fried), but still has a crunchy coating on the outside and tender, juicy meat on the inside. Make these oven-fried chicken thighs any night of the week for a great go-to family meal. The tastes of Greece add welcome savory, salty, cheesy flavors to this simple and inexpensive dish that's elegant enough to serve for company, but makes a great weeknight meal. Stuffed chicken thighs are ready in an hour start to finish, and are a fantastic way to enjoy chicken. Everyone's favorite chicken cacciatore just got easier to cook for dinner, thanks to the slow cooker. Boneless chicken breasts, sliced mushrooms, and garlic are cooked with sauce ingredients in your crockpot for a wonderful, rustic dinner that will make your family and friends ask for seconds. Using chicken thighs ensures juicy meat, after hours of cooking. A delicious and comforting dish, served over hot cooked spaghetti or another favorite pasta. Tender chicken thighs in a mouth-watering orange sauce make a fabulous everyday weeknight dinner. Chicken thighs are baked and glazed with a flavorful, simple, complex-tasting orange sauce that includes brown sugar and aromatic herbs. You could also serve this dish as a great, inexpensive meal for company, alongside some rice pilaf, a tossed green salad and perhaps some white wine. Who says you can't eat like a king/queen on a budget? Jambalaya is a tasty dish of Louisiana origin, in which meat, vegetables and rice mingle in happy harmony. This flavorful slow cooker jambalaya recipe combines three types of protein - chicken, sausage and shrimp - for a filling and tummy-warming winter meal. With rice, tomatoes, vegetables and Cajun seasonings, this great family dinner will fill your kitchen with down home Southern aromas. What could be a more welcoming sight on a cold winter night than a steaming bowl of warm chicken and dumplings? Chicken thighs are used in this homey recipe that tastes just like something your grandmother would make. Fluffy, cloud-like dumplings nestle with tender chicken chunks in a delicious, comforting herbed broth. Can you serve chicken thighs when entertaining company? Absolutely, you can! Inexpensive chicken thighs get the snazzy treatment in this delectable, aromatic, rich tasting dish. Tender, sautéed chicken thigh are slathered in a creamy, satisfying sauce made from a little white wine, broth, garlic, cream, and mushrooms. It's so easy to prepare, and makes a wonderful meal for company or a romantic dinner at home. Do you love Thai food but find it expensive? Here's a super easy and budget-friendly recipe that creates the authentic flavors of Thai take-out food at home, with just a few ingredients. Store-bought red curry paste is the secret to this dish, which is ready in just 30 minutes, but tastes like it took all day to prepare. Chicken thighs are poached in coconut milk with curry paste, diced sweet potatoes and fresh cilantro, for a delicious dish you'll be proud to serve. Your family will think you spent all day in the kitchen, when you serve up this super-easy pasta casserole recipe that's ready for the oven in 30 minutes. To make this classic Chicken Manicotti dish, tender, boneless skinless chicken thighs are baked in a casserole dish with manicotti pasta shells, store-bought spaghetti sauce, Parmesan cheese and Italian seasonings until the whole thing is hot, bubbling and ready to eat. Chicken and sausage taste fantastic together, so it's no surprise that they're the stars of this classic Portuguese dish that makes a warming, satisfying winter meal. Set it and forget it - the whole thing comes together in your slow cooker, so you don't have to do a thing once it's cooking away. Spicy chorizo sausage and chicken thighs are slow cooked in your crockpot with tomatoes, artichoke hearts and olives, for a festive and exotic dish that is easily made with foods you'd easily find at any grocery store. Rich, fragrant and flavorful, this recipe is perfect served over hot rice for entertaining. In this budget-friendly recipe with chicken thighs, classic beef stroganoff is transformed into chicken stroganoff. Chicken thighs are enveloped in a rich, smooth, savory homemade sauce made with mushrooms, broth, herbs, white wine and cream. Serve it over egg noodles or your favorite long pasta noodles for an elegant, filling dish that's wonderfully warming and comforting on a cold winter's night. Chicken scaloppini is often made using chicken breasts, but this version uses flavorful and budget-friendly chicken thighs for a meatier flavor. 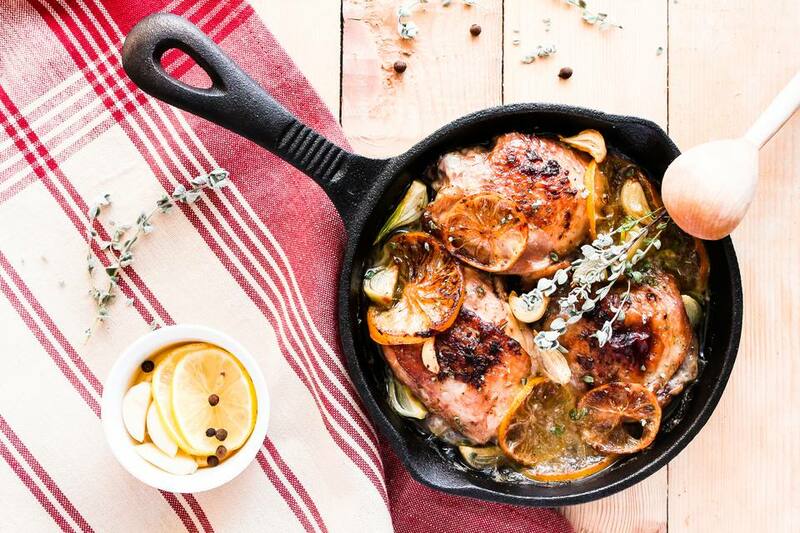 Boneless, skinless chicken thighs are pounded thin and cooked in a fragrant lemon tarragon sauce in this elegant recipe that's great for entertaining. Serve it over hot cooked pasta or rice. Sticky, hoisin-glazed meatballs are a Chinese food delicacy that's ridiculously easy to make at home. Just follow this recipe for glazed chicken meatballs that can be finished on the stove top or in the slow cooker, and taste juicier and more full-flavored than versions prepared with chicken breasts. The spicy Asian sauce is a snap to put together, but if you have a tight schedule, go ahead and use a purchased sweet and sour sauce or an Asian-style simmering sauce. These meatballs make a great party appetizer or main dish at family dinner. Just serve over hot cooked rice or noodles and enjoy. Buffalo Chicken Tacos combine two favorite food trends - buffalo wing flavors and tacos! Make these tacos with cooked chicken thighs for a more flavorful, meaty taste that goes very well with Mexican seasonings. Filled with tender chicken, celery, hot buffalo wing sauce, onion and garlic, these tasty chicken tacos are a great way to use up cooked chicken and a delicious family dinner any day of the week. This one-pan roasted chicken and vegetable dinner is so easy to make, you could easily serve it on weeknights, but it's pretty and delicious enough for entertaining company. Bone-in chicken thighs are seared golden perfection, then lightly brushed with honey-mustard sauce and finished in the oven. The Brussels sprouts, bacon and pear combination that accompany them make a fabulous side dish. Best part is, everything is cooked together in one large skillet or sheet pan, so your whole dinner is ready in about an hour, with only one pan to wash. If you like your chicken with crispy skin, this recipe is sure to please. With only two ingredients, it couldn't be easier to make, either! Chicken thighs are seared in a large, heavy oven-safe skillet on the stove top to crisp up the skin, then moved into the oven to finish baking to juicy perfection. Makes a fabulous everyday meal. Brunswick stew is a traditional dish that's popular in the American South. This Brunswick stew recipe is made with cooked pork shoulder or leftover pulled pork, along with shredded, cooked chicken thighs and vegetables. Flavored with store-bought barbecue sauce and a kick of cayenne pepper, this is a rib-sticking stew that's perfect for warming you up, when you come in from the winter cold. Flavorful and inexpensive chicken thighs are baked with a homemade barbecue sauce for a delicious everyday meal your family will ask you to make again and again. Just use some store-bought grill seasoning flavors the chicken thighs, which are then seared and baked to perfection with a sticky, then add your sweet and savory homemade barbecue sauce. Or, if you want to make this recipe even easier during busy weeknights, just use your favorite store-bought sauce. We won't tell, if you won't! Pulled pork lovers, here's how to get that savory, sticky, sweet barbecue flavor in an inexpensive recipe that uses chicken thighs in place of the usual pork. An easy homemade barbecue sauce makes this easy slow-cooked, shredded crockpot chicken moist, tasty and and juicy. This pulled chicken is a fantastic alternative to more traditional barbecue dishes, and it is just as delicious, if not more. Includes tips for tweaking the sauce to suit your own tastes, from spicy to sweet. Tender chicken thighs lend flavor to this delicious Asian stir-fry made with pungent fermented black beans. You can prepare the vegetables ahead of time, while the chicken is marinating, so you can just toss them into the pan when you're ready to stir-fry. Makes a great tasting and inexpensive dinner served over hot cooked rice. Mexican food for dinner? Yes, please! This chicken thigh recipe is a great choice when you're looking for an easy, but tasty, chicken recipe for the slow cooker. Boneless chicken thighs are affordable, and easy to prepare and cook in the crockpot. This Tex Mex-flavored dish with chicken, corn, black beans and green chiles is delicious served over Mexican style rice, with a simple salad on the side. Inspired by the Chinese take-out classic dish, this easy recipe for Sweet and Spicy Crockpot Chicken combines two store-bought sauces - sweet and sour, and barbecue - with tender chicken thigh meat in a five-ingredient recipe with a fabulous flavor. Wonderful as a weeknight family dinner served over hot cooked rice. This wonderful recipe for honey mustard chicken thighs is so simple to make and is ready in less than 30 minutes. The chicken is cut into strips and simmered in a rich, tangy honey mustard sauce along with carrots, onions and garlic to make a fragrant and flavorful dinner. Add your favorite vegetables to the cooking, to make this dish your own. It's great as a family dinner on busy weeknights, served atop hot cooked couscous, cooked brown rice or pasta. This fragrant and mouth-watering lemon chicken dish was inspired by Middle Eastern cuisine. It uses plenty of garlic, saffron, fresh thyme and pine nuts to flavor juicy, tender chicken thighs and nutty-tasting Jerusalem artichokes (edible tubers also known as sunchokes). Chicken thighs are quickly browned before being slowly simmered in an aromatic garlic chicken broth with fresh lemon juice and grated zest. Saffron adds a delicious flavor and beautiful color to this dish which is special enough to serve for entertaining. Grated fresh ginger adds an extra kick to the flavorful marinade that's used to prepare this delicious grilled chicken. The marinade does double duty as a basting sauce while the chicken thighs are grilling, to keep them moist and juicy. All-season recipe can be cooked on the grill in summer, or use your oven's broiler in colder months.